Artist’s rendition of the C Sword 90 stealth corvette. Image: courtesy of Verhaaren Naval Architects. The concept design of the C Sword 90 corvette was unveiled at EURONAVAL 2014 exhibition. Image: courtesy of Verhaaren Naval Architects. The C Sword 90 corvette can accommodate a 10t helicopter. Image: courtesy of Verhaaren Naval Architects. The corvette can sail at a maximum speed of 28kt. Image: courtesy of Verhaaren Naval Architects. A novel and innovative C Sword 90 stealth corvette concept design was unveiled at EURONAVAL 2014 exhibition held at Paris in October 2014. The corvette will feature a new hull and superstructure designed and developed by Constructions Mecaniques de Normandie (CMN) in collaboration with Thierry Verhaaren Architecte Naval (TVAN). The C Sword 90 corvette can be deployed in deterrent missions, coastal and offshore defence, anti-submarine warfare (ASW), anti-surface warfare (ASuW) and anti-air warfare missions. DCNS of France first announced the Gowind family of corvettes in 2006. Since the initial announcement, DCNS has enlarged the Gowind family to four corvettes with length from 85m to 105m and displacement from 1,000t to 2,500t. The C Sword 90 stealth corvette is designed to feature a stealthy hull with sloped surface and highly-integrated equipment. The vessel’s round bilge shaped hull is made of steel, while the superstructure is made of steel/aluminium. The vessel can accommodate 65 crew members and can be fitted with 20 additional berths. It will be classified by Bureau Veritas (BV). The corvette will have an overall length of 95m, overall beam of 15.7m, and maximum draught of 4m. The length and beam of the vessel at waterline will be 92m and 12.7m respectively. The vessel is designed as a compact and multirole craft that can operate in high intensity war situations while meeting the requirements of modern day naval forces. It can be used in multiple missions including coastal and seaward Intelligence, Surveillance & Reconnaissance (ISR), electronic warfare tasks, scouting, and ground operations support. The corvette can also carry two 11m high speed rigid-hulled inflatable boats (RHIBs) with dedicated davits, unmanned surface vessels (USV) and underwater unmanned vessels (UUV). The vessel will feature an extensive sensor package with electro-optronic surveillance and tracking system that can be used for ISR missions. The naval radar with four fixed array panels will ensure continuous 360° coverage over the sea and air. The corvette will also be equipped with fire control radar, radar electronic support measures (RESM), Communications Electronic Support Measures (CESM), and an Integrated Bridge Control System (IBCS). The onboard sensors will be interfaced with the integrated naval communications system and IBCS aboard the vessel. The corvette can be armed with one 76mm or 57mm gun mounted at the forward bow deck. Two remotely controlled 20mm or 30mm guns are placed on port and starboard side. 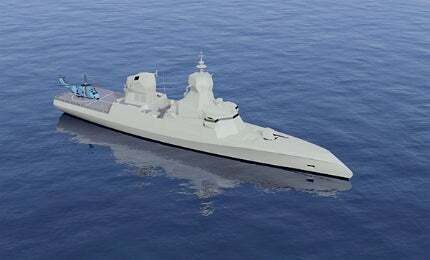 The vessel will also be equipped with eight MM40 Exocet anti-ship missiles and 16 vertically-launched anti-air missiles. Two short-range air defence missiles on the deck will further enhance the protection against aerial threats. The two triple-tube torpedo launchers will allow the vessel to strike enemy submarines. "The C Sword 90 stealth corvette is designed to feature a stealthy hull with sloped surface and highly-integrated equipment." The vessel will be fitted with a decoy launching system for deceiving incoming anti-ship missiles and torpedoes. It will also integrate a hull mounted sonar and a towed sonar for conducting anti-submarine warfare (ASW) operations. The C Sword 90 will feature a Level 1 Class 3 aft heli-deck supporting a 10t-class helicopter during day and night missions. The vessel is powered by two propulsion diesel engines driving two controllable pitch propellers (CPPs). It is also equipped with three main generator sets and one emergency generator set. The corvette will have a range of 7,000nmi at an average speed of 12kt, and can sail at a maximum speed of 28kt. It will have 170m3 of fuel and 30m3 of fresh water storage capacities.